Technology has become very integrated in our lives today. The majority of us are dependent on our phones, computers, or both. Students today use technology in the classroom, at home, and on-the-go for both schoolwork and entertainment. If you are reading this blog right now, you can see how technology plays a role in your life. How did you come to this page? Did a friend show it to you? Did you search it online? The point I’m trying to make here is that we are so used to being online that we may not be as cautious as we used to be when it comes to things like identifying potential online scams. But in fact, falling victim to an online scam is still a very real danger… and one that can cost us everything up to our identity itself. So here are 9 Tips to Avoid Scholarship Scams — online, but also elsewhere! The next 8 tips will go into more detail, but I wanted to first provide you with a basic overview of characteristics you can look for to help you identify a scholarship scam. Ask for bank account info — your credit card number! Be INCREDIBLY easy… not all scholarships are difficult, but double-check if it seems unbelievably simple. Now that you have a good overview of what scholarship scams look and sound like, here’s 8 more tips on how to avoid them! Finding scholarships is easier than you think nowadays, but so are your chances of stumbling into a scam. When you are writing a research paper, it is important to check multiple sources to verify that the same information is shown on every page. Why? Because anyone, anywhere, can put ANYTHING online. Do the same thing with your scholarships. In your scholarship search, if you find a scholarship on one site, type the name into Google and see what else you can find about it. In the example above, we use Chegg’s Monthly Scholarship of $1,000. 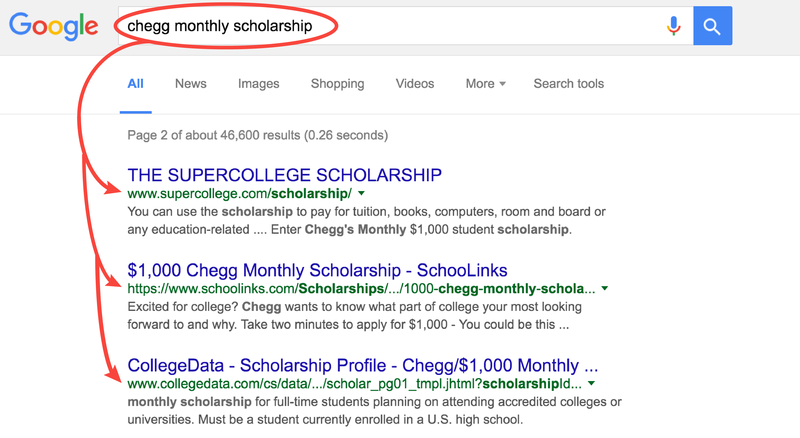 The key thing we look for here is other sites that mention Chegg’s scholarship besides Chegg. But if you remember from my article on research papers, good research is not a one-step process. Make sure to check the sites that mention your scholarship to see how reliable THEY are. 3. Don’t enter personal or financial information! Because we DO make online purchases pretty regularly these days, it can feel more casual for us to enter our financial information into online forms. But additionally, if a scholarship is asking for you to enter an entire form of information asking questions about your parents’ annual income, YOUR annual income, or whatever, beware! Sometimes it can seem like this information is trivial… but it really doesn’t take much for things to go wrong. Talented hacker, Pablos Holman shows us in his TED talk how unsecure things like our credit cards and cell phones can be. There’s companies out there who will offer to write your scholarship applications for you. First of all, if you don’t write your own scholarship application, you are cheating. But there are other consequences that DON’T require you get caught, and the largest is this: You will spend tons of money on a scholarship application that does NOT guarantee you that scholarship, and may or may not ever actually deliver any results after you pay. Your finances may also be insecure after giving up your credit card information to that site. There’s a number of “hook” phrases I’ve found that hint at a scholarship being a scam. In fact, I was able to find a real-life example for you. Is this site legitimate? A better question to ask is: Is it worth the risk? 6. Don’t pay money up-front, or at all, ever. Whether it be in “application fees” or to sign up for a site that allows you to search scholarships, you should NEVER have to pay upfront to get scholarships. Likewise, you may be told that you won a scholarship but need to pay some other kind of fee to receive the money — what is that about? If the organization is asking you to pay for your scholarship in any way, it is a scam. If you come across a scholarship, you should ALWAYS be able to find contact information to ask additional questions you may have about the scholarship. 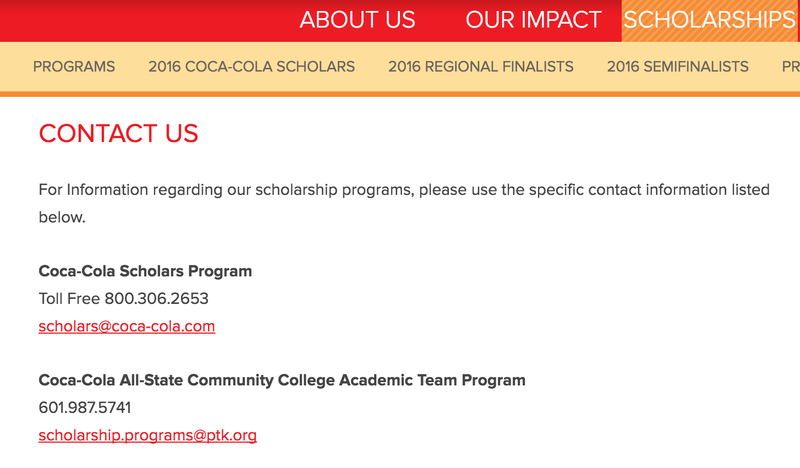 An example, the Coca Cola Scholarship Foundation lists its contact information at the bottom of the web page. And while you probably didn’t expect a company as big as Coca Cola to scam you, this is something that ALL scholarships should show. If you feel something is wrong when you go to apply for a scholarship, you’re probably right to feel that way. Even though we are more adjusted to the online world, most of us can still recognize the difference between a potentially spammy site and one that is probably legitimate. Sometimes we have a gut feeling about things, and a scholarship might feel too good to be true. If it doesn’t feel right, it could be a scam. Students and families should follow their gut feeling when deciding to apply for a scholarship or not. 9. Don’t fall for flattery or fluffy titles. You may get an email that says you “have been selected” based on your “academic merit” for a scholarship you didn’t apply for. First of all: You didn’t apply. That’s a red flag. But sometimes when we hear compliments like this, they can be distracting. The email may look official enough, and we may feel flattered that we have PERSONALLY been contacted! The truth is that whoever sent that email could care less about your GPA (whatever it is at the moment), they’re interested in your pocketbook. Remember, ANYONE can post something online. A scholarship you find may be offered by a “Foundation” or a “National” something, but don’t get flustered by these big, official-sounding titles. They could very easily be made up. Make sure to refer to Tip #2 above and do your research. What if I think I may have fallen victim to a scholarship scam? Report the scam! FinAid offers a number of ways to report a scholarship scam. So there you have it. There are hundreds of thousands of dollars waiting for you in scholarships. I personally earned over $85,000. Don’t lose hundreds of thousands (and potentially your identity) in the process of earning them! Don’t pay money upfront, or at all, ever. Has you or someone you know ever been a victim of a scholarship scam? What tips can you add to be safer? Let us know in the comments below! Thank you for sharing such valuable insight. I am a big fan of your site! You hooked me with the first article I read, I hope you are hooking students and their parents as readily as you did me. Your point about “starting in middle school” is so important and I fear that whole thread gets lost in the urgency of ACT and SAT, etc. If you want to talk about my thoughts, I would enjoy that. You keep writing and I’ll keep reading! This has SO MUCH potential! Warmest regards, Jody Steiner Coates, Ph.D.